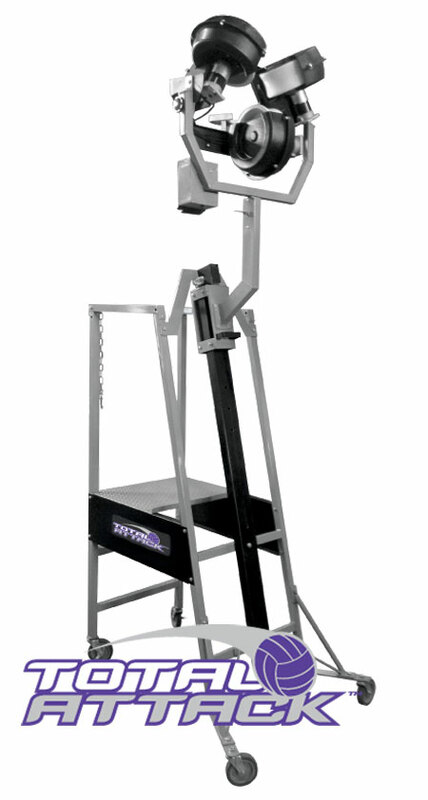 Precise Repetition Training: The new three-wheeled Total Attack volleyball machine was designed under the direction of top international and collegiate coaches to provide sidespin and increased power to match the highest level of play. It will deliver thousands of reps in daily practice of serve receiving, digging and spiking. With three extra-wide throwing wheels, accuracy and repeatability are assured in every drill, eliminating time wasting errant hits. and provides the highest serve release point of any machine. Spiking: The Total Attack delivers the ball at realistic angles from over the net at top speeds to make actual game conditions a part of every digging drill. Setting: Providing rapid reps at varying intervals, the Total Attack will meet the requirements of all setting drills. Accurate and consistent soft sets with no spin are provided at any angle and height. This machine can be set to release the ball from a realistic setting height, not from floor level like some competitive units. The locating pins on the shaft will allow you to instantly position the throwing head down to the setting position. Ball wear is extremely limited due to the three 4″ wide, soft white polyurethane ball gripping surfaces and the contoured shape of the ball throwing wheels that uniformly distribute the contact forces, eliminating the high wear contact points. With three wheel surfaces, ball wear is further reduced from any other wheel machine on the market. Vertical movement coupled with the horizontal movement, means the coach can instantly throw the ball to any point on the court, creating game situations & challenging the players to perform in progressively more difficult circumstances. Portability: The extra-large rolling wheels provide effortless, safe machine mobility to any location on the court and the extra-wide base provides stability to accommodate power and breaking serves. Storage: The Total Attack will fit through any standard 3′ door for safe storage. The throwing head can also be removed, allowing storage of the frame in the open gym. A machine cover is available separately and is used to protect and secure the machine during storage. The Total Attack can be safely operated by any assistant coach, player, student or parent. This frees the coach to be by the receiving players to teach proper mechanics effectively. No more yelling across the court. It also allows the coach to improve the quality of standard drills and to create new machine drills for every phase of the game. The Total Attack platform has a 16-gauge diamond plate, non-slip surface for sure-footing and safety during use. The frame of the Total Attack is powder-coated, rust-resistant steel tubing for extreme durability. The extra-wide base of the Total Attack machine assures real stability. As the throwing head is raised, it moves towards center of gravity, further insuring stability. Two powerful variable speed motors directly drive indestructible 4″ wide ball throwing wheels. Rapid recovery provides rapid repetition, no waiting for air-powered launch system to recover. Performance Throwing head pivots easily delivering ball to any location on the court. Spin, speed and tempo can be adjusted instantly between throws. More difficult to place ball, must move the entire machine to introduce variation. Air propelled arm will not impart a spin on ball. Point Realistic – elevates from 5′ to well above men’s net, over 9′ 3″. Pivots up to only 6′ (well below both men’s and women’s net height). Durability Few moving parts, heavy duty welded powder-coated steel frame. Complicated air pressure system installed in metal frame encapsulated in a plastic shell. Feeding and Tempo Coach can control tempo by feeding continuously or delays. No recovery time is ever needed. The speed, angle and spin are instantly controlled by the coach with each serve, set or spike. Air-propelled machine can be set to toss up to 1100 balls per hour (one ball every 3.28 seconds). However, recovery time is necessary after rapid fire of 8 –10 balls. Ball Use and Wear New design includes specialized throwing wheels that are shaped to grip the ball with even pressure across a wide 4″ span to increase velocity and minimize ball wear. No specific ball required. Digging With the Attack & Attack II the ball is released from above the net, a true downward trajectory at high speeds, providing unmatched spike simulation with realistic reaction time for the ultimate digging drills. Not capable of delivering a true spike over a regulation net. Spike drill must be performed from same side of net, below net height, severely limiting ball travel distance & player’s reaction time. Serving Up to jump serve speeds and release point. Breaking top spins and floaters. No spin limits serve to a simple floater. Low release point requires an arc to clear net & slower speeds to keep in court. 2018 Sports Attack, LLC All Rights Reserved.